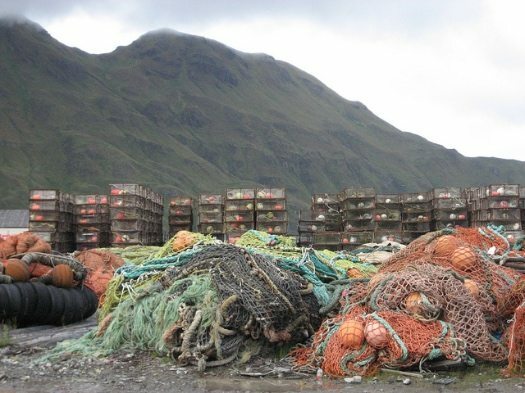 “Ubiquitous crab pots and fishing nets at Dutch Harbor. Alaska, Dutch Harbor” Photographer: Michael Theberge, 2nd Mate Coastal Nomad. Credit: NOAA. Tom Chard, executive director of the Alaska Behavioral Health Association, wrote an op-ed for the Alaska Dispatch News describing the consequences for his trade organization members if the Alaska Legislature does not manage to avert a July 1st statewide government shutdown. The current budget standoff between the Republican-led Senate and Democrat-led House has lasted for some five months. Two of the past three years have seen the state government enter June without an agreed-upon budget. Alaska Dispatch News offers this comprehensive look at the consequences of a statewide shutdown. Chard describes why health care services in particular would be hard hit. Years ago, the state made the decision to contract with private, nonprofit treatment providers instead of providing health care services directly. These nonprofits have relied on a system of annual grant funding to offer those services for years. Year after year, behavioral health providers have worked with the ebb and flow of our state’s economy trying to make sure that the critical services we provide are available to as many people as possible. According to the State of Alaska Department of Health and Social Services, in 2017, the department awarded more than 500 grants to over 200 agencies, totaling more than $165 million. A government shutdown would suspend services not directly linked to immediate life and safety needs, beginning July 1, 2017. This includes suspending grant payments to health care providers, and health facility licensing. Chard notes that his nonprofit member organizations do not typically have sufficient reserve funds. In the event of a statewide government shutdown, they would need to cut services, the first likely being outpatient treatment services such as supportive employment services, supportive housing services, and case management. Chard adds that cutting or at least suspending these services does not save money. Kids stay in state custody, people cycle back through public safety and into the prison system, and problems that are easier to address grow more complicated and costly. This year’s preparations for a government shutdown are different than in 2015, when the legislature had passed a partially funded budget. This year, money has not been appropriated for any government services. As a government shutdown in Alaska is unprecedented, Department of Law is examining what money could be spent to continue vital state services if the legislature has not fulfilled its constitutional obligation to pass a budget. In the case of Anchorage Community Mental Health Services, an agency picked at random among the 200 organizations funded by the Alaska Department of Health and Social Services, their 2014 annual report (the most recent available from the organization’s website) shows they “raise” $20,641,400 in revenue this way: $8,681,551 from client fees, $10,923,850 from grants, and just $1,035,999 from “Other.” $9,809,473 of this funding covers “charity care,” unreimbursed or under-reimbursed services. They will be hit hard by a state government shutdown, and no amount of emergency fundraising from their community will make much of a difference. They’re not alone. According to the National Center for Charitable Statistics, public charities receive about 21 percent of their revenue from contributions, gifts, and government grants; 72 percent from program service revenue, including government fees and contracts; and 7 percent from other sources such as dues, rental income, etc. Many people writing and speaking about nonprofits today describe the sector as looking for the next “ice bucket” retail fundraising concept, as if marketing and online fundraising were the preoccupation of every charitable initiative. That is far from the reality faced by most nonprofits. The threat of statewide government shutdowns is no longer unusual. Maine and Washington are also among those states facing this agonizing test of wills this month. Wikipedia documents what happened in Minnesota in 2011 when the state actually did shut down. The federal shutdown taught us all a lesson regarding the financial fragility of so many US families. Will philanthropy take heed?